Tag line: "It Took Over 100 Years ... 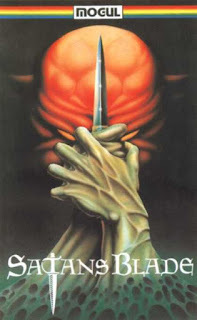 But the Blade Got Even"
A 1984 slasher directed by L. Scott Castillo, Jr., Satan’s Blade is something that no movie, let alone a horror film, should be: it’s boring as hell! To be fair, there is a bit of excitement at the beginning: a daring daylight bank robbery is pulled off by two women (Meg Greene and Mary Seamen) who shoot a pair of tellers before making their getaway. The lady thieves get their comeuppance, though, later that night when a knife-wielding maniac surprises them at their mountain resort hideaway. From there, Satan’s Blade introduces The main characters. First, we have two couples: Al (Thomas Cue) and Lil (Janeen Lowe), who are tagging along with Tony (Tom Bongiorno) and his wife Lisa (Elisa R. Malinovitz). Tony, a fledgling lawyer, has just passed the bar, and to celebrate the four decided to take a trip to the mountains. In the room right next door to them are five beauties, including Sue (Ramona Andrada), who is haunted by the death of her father; and Stephanie (Stephanie Leigh Steel), a pretty brunette who develops a crush on Tony. Unfortunately, their timing stinks. The resort is still reeling from the murder of the two bank robbers (Sue, Stephanie and their friends are in the very room where the tragedy occurred), and, according to the cryptic old lady at the reception desk (Carrol Cotion), the recent killings were likely the work of a demented woodsman who, after being driven from his home years earlier, prayed to the mountain Gods for help, only to have his prayers answered by an evil spirit. Per the old crone, this demon gave the woodsman a weapon forged in hell, then told him to kill with it (don’t get too excited: it looks like an ordinary knife). Naturally, the new guests laugh off the old woman’s warning, which (to no one’s surprise but theirs) proves to be a very costly mistake. As mentioned above, Satan’s Blade gets off to a strong start (the robbery, as well as the subsequent scene at the resort, definitely piqued my interest). But then the movie shifts into low gear for a good 45 minutes to develop its characters (Tony and Lisa are having marital problems, and Sue has a nightmare about the killer that’s actually quite prophetic). The problem is that the acting is so mediocre, the dialogue so trite, and the production values so low (I saw the boom mic pop into view at least four times) that these character-driven scenes feel like they stretch on forever. The movie does eventually get down to business, but by then I was so bored that I just wanted it to be over. Toss in some unimpressive kills (there’s blood… just not that much of it), as well as a twist ending that’s kinda frustrating, and you have a slasher that’s more likely to cure your insomnia than excite your senses.